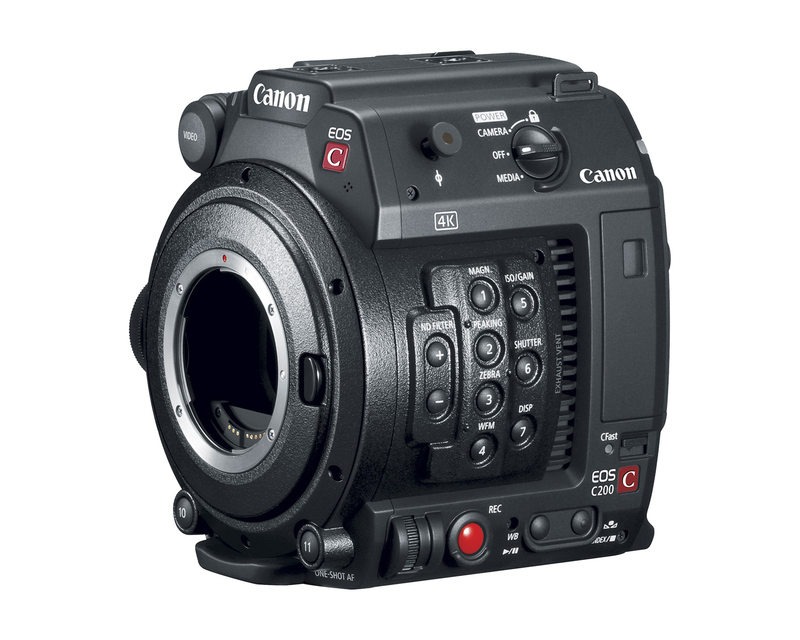 Canon will present 2 new Cinema EOS digital cine cameras at Cine Gear: Canon EOS C200 and EOS C200B. C200 and C200B cameras have two 4K video formats inside: Canon’s new Cinema RAW Light and MP4. Canon’s Dual Pixel CMOS Auto Focus system. The cameras come in two configurations–same insides; variations outside. C200 is the full production-ready camera package that can be used right out of the box, with an LCD Monitor, nice mounting brackets, Camera Grip and Handle and a 1.77 million dot OLED pivoting Electronic View Finder (EVF) at the rear. 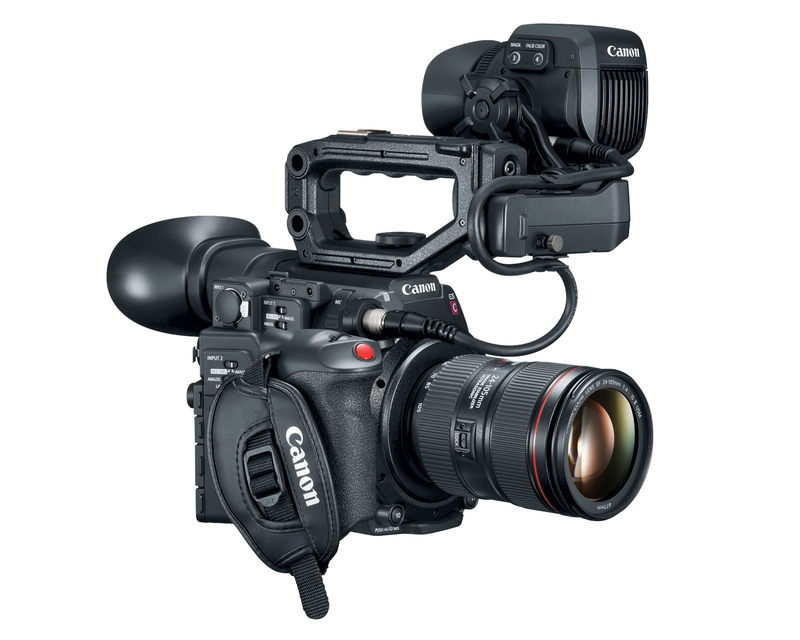 The C200B is the same camera — but without the EVF in back, without handle, handgrips, LCD monitor or brackets. In other words, this is the lighter, streamlined version for gimbals, drones, remote operation, Steadicam, or if you want to build up the package yourself with your own handles and handgrips. The C200 and C200B have an 8.85 P CMOS sensor with a newly developed dual DIGIC DV6 image processing system that includes improved HDR images. Internal recording ranges from Full HD (1920×1080) and 2K (2048×1080) to 4K UHD (3840×2160) and 4K DCI (4096×2160). There are two new 4K file formats. Cinema RAW Light, in 4K 60p/50p 10-bit and 30p/25p/24p 12-bit, is recorded internally to a CFastTM card by reducing data size to about one-third to one-fifth of a Cinema RAW file, without losing grading flexibility. An edit-ready MP4 proxy file can be recorded simultaneously to the camera’s internal SD card slot. 4K UHD MP4 files can also be recorded to SD media cards at 60/50/30/25/24P 8-bit. Slow motion Full HD recording is supported up to 120 fps. Both cameras have Canon’s popular Dual Pixel CMOS Auto Focus system. It provides accurate, continuous AF and face detection AF when using EF lenses. The LCD Monitor LM-V1 (supplied with the C200 camera), has a touch-screen offering “touch the area you want in focus” capability. Editing and grading of Cinema RAW Light video format will be supported by Blackmagic Design DaVinci Resolve. Editing will also be possible in Avid Media Composer using Canon RAW Plugin for Avid Media Access. This format can also be processed using Canon’s Cinema RAW Development software. Demonstrations using these software programs will be given at the 2017 Cine Gear Expo, June 1st-4th in Hollywood, CA. Adobe Premiere Pro CC will support this format by the end of 2017. Editing will also be possible in Apple Final Cut Pro X using Canon RAW Plugin for Final Cut Pro X around the second half of this year. Good companions to the EOS C200 Cinema Camera are the COMPACT-SERVO 18-80mm T4.4 EF ($5,225) and the recently announced COMPACT-SERVO 70-200mm Zoom Lens (scheduled to be available later in 2017, estimated $5,800). Why no centre crop like c300 mk2 to be able to use b4 lenses? ?